Watch all your favourite Big Bang & Wonder Girls MVs here! We’ll try to upload MVs with english subs for your viewing pleasure. If there’s any MVs that are missing, please leave a comment behind! 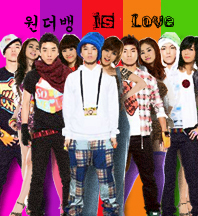 wonderbang for me is the best K-GROUP. they are deserving to be awarded by their own country. Drop an e-mail at wonderbang.love@gmail.com for any queries/matters. Or if you have any news to share. G-Dragon and Ye Eun – One of top 5 idols stars who transformed into successful composers!